After struggling to hit its readmission rate goals, Park Nicollet Methodist Hospital adopted a text-first approach to patient outreach for follow-ups that reduced readmissions and nurse workloads. Readmission rates are a key factor in quality ratings and reimbursement levels, but lowering them can be a challenge. While following up with patients post-discharge is a proven method of reducing readmission rates, getting in touch with patients over the phone is difficult and time-consuming. Park Nicollet’s nurses were spending a significant amount of time calling patients and leaving messages, but readmission goals still weren’t being met. Joan Sandstrom, VP of primary care at Park Nicollet, knew a solution had to exist that was more efficient, allowed them to reach more patients and did not add to the nursing workload. After searching for other patient engagement methods, Sandstrom and her team partnered with PerfectServe to implement an automated, text-first patient follow-up solution at Park Nicollet Methodist Hospital. PerfectServe built a series of customized follow-up text messages that assess each patient’s risk for readmission. Rather than having nurses call each patient individually, the PerfectServe solution delivers this simple series of text messages to patients automatically. The PerfectServe online dashboard collects and analyzes every patient’s responses — and nonresponses — and automatically flags patients for follow-up. Nurses receive these notifications, which are then used to inform their patient engagement strategy. With PerfectServe, nurses get a global view of how their patients are doing and how they should prioritize patients who need additional attention to reduce the likelihood of readmittance. Overall, 70% of questions sent via text message received a response from patients, reducing the number of phone calls from nurses by 25%. PerfectServe made it possible to segment Park Nicollet’s patient population into risk categories, highlighting the 17% of cases that needed immediate follow-up. These findings were presented at Park Nicollet Methodist Hospital’s monthly Readmission Council, and as a result of their success with PerfectServe, Park Nicollet elected to expand the solution to other hospitals in the system. A member of MemorialCare, Orange Coast Memorial Medical Center is a not-for-profit, 218-bed hospital located in Fountain Valley, CA. The organization serves the community with more than 12,000 hospital admissions and 23,000 visits annually. Both the hospital and the health system have a long history of focusing on quality and safety and were early adopters of an electronic medical record (EMR) system to improve clinical communications. Although Orange Coast Memorial Medical Center had implemented lean management techniques for several years, leaders saw additional areas in which to remove excess waste, including the clinical communication process. As part of an ongoing commitment to performance improvement and reliability, leaders focused on improving clinical communication in two key realms: between nurses and physicians and between emergency department (ED) staff and physicians. The organization’s specific goals were to reduce variation in time to call back, reduce time wastage for “phone tag,” increase nurses’ time in direct care and improve nurse satisfaction. According to Orange Coast Memorial’s executive director of information services, inefficiencies in the communication process prior to the improvement efforts affected throughput, added costs and caused frustration for patients and staff. Nurses spent a significant amount of time contacting physicians, which sometimes translated into delays in care. Tim Horttor, BSN, RN, CCRN, a critical care nurse at Orange Coast Memorial, notes that before PerfectServe, nurses often searched in three different locations to find telephone numbers to contact physicians—a paper list of the call schedule, within the EMR system to identify the assigned physician and on notes taped to patient charts. When nurses contacted the physician’s answering service, they spent precious minutes providing a host of information, including the patient’s name, status and room number. A time-motion study found that the communication cycle for nurses contacting physicians was complicated and disjointed and included multiple potential points for gaps. In addition, nurses waiting for callbacks after a shift change clocked overtime hours (at 1.5 times the standard hourly rate), which increased costs. Emergency department staff struggled to communicate efficiently with primary care and specialty physicians. The delays sometimes translated into slower flow through the ED, with patients waiting for admission or additional care. More times than hospital leaders would like, the ED was required to go on diversion status. In addition, executives in the information systems and compliance departments were concerned about unsecure texting on personal phones. They wanted a secure communication system that would also provide physicians with autonomy to control the mode by which they are contacted. Orange Coast Memorial implemented PerfectServe over the course of four months in 2012. A dedicated team helped train staff and enroll physicians. After a relatively short learning process, hospital staff noticed a substantial streamlining of the communication process. With PerfectServe, nurses can open a Web portal and send a secure text to a physician. Often they find that the requested order change is entered directly into the EMR by the physician within a few minutes — with no additional time required for callbacks. Nurses are more confident that their message is received with the new communication process. They can also easily place a telephone call to the right physician if a direct conversation is needed. With a single secure communications platform, Orange Coast Memorial leaders are now confident that texts and other modes of communication are HIPAA-compliant. They can track communication cycles if need be, to identify whether messages have been sent to unsecure devices and, if so, to ensure that personal health information was redacted. Orange Coast Memorial has reported seeing a number of improvements in clinical communications since implementation. A repeat time-motion study confirmed that the communication process was much more streamlined, with nurses spending less time in the communication cycle than prior to implementation (see figure below). Physician call-back time was shortened substantially, from an average of 45 minutes to an average of 14, and the proportion of call cycles completed within 2 minutes increased from 11 percent to 22 percent. In addition, the variability in response time was reduced, with fewer outlier cycles (see figures below). Nursing satisfaction has improved since implementation due to reduced frustration and more time for direct patient care, according to Horttor. Orange Coast Memorial has received unsolicited comments from frontline nurses and nursing executives about the substantial improvement they’ve seen with PerfectServe. One nurse shared, “This is the best thing you’ve ever done for us…” Orange Coast Memorial believes their response reflects the fact that PerfectServe has a direct impact on their daily life, enhancing their workflow and quality of life. Patient satisfaction has also improved. Overhead paging has been virtually eliminated, reducing the noise level within the hospital and improving the patient experience. The hospital’s HCAHPS scores have increased by 2.4 percent between the year prior to PerfectServe implementation and the year after implementation. The specific measure of pain control was improved by 4.4 percent, a change that Orange Coast Memorial believes is directly tied to the faster communication cycle with PerfectServe. Administration at Orange Coast Memorial is pleased with the investment made in PerfectServe. In addition, the hospital has received a direct cost savings since PerfectServe implementation. The number of overtime hours was reduced by more than 1,000 over the year after implementation, translating to a savings of more than $56,000. Orange Coast Memorial Medical Center implemented PerfectServe in 2012. Use of PerfectServe has streamlined clinical communications, improved ED flow, reduced response time, improved nurse satisfaction and enhanced the patient experience. PerfectServe is helping support increased direct care time and an improved patient experience as part of Orange Coast Memorial’s ongoing commitment to providing high-quality care. Munroe Regional Medical Center (MRMC) had a long history of prioritizing performance improvement initiatives. Leaders at the 421-bed, not-for-profit, community hospital were well-versed in Six Sigma and other performance improvement strategies. The organization had already streamlined many care processes and had eliminated waste throughout the system. However, MRMC leaders recognized the need for a standardized process to ensure timely clinical communications, especially given the high volume of communications events at the organization: the 450 physicians and 2,500 clinical staff members completed more than 150,000 calls per year. MRMC had been using a home-grown system for contacting physicians, relying on telephone calls to physician offices or answering services, which often proved unreliable and inefficient. Leaders realized the organization needed a systematic, reliable process for contacting physicians. Senior Vice President of Medical Affairs and Chief Quality Officer Lon H. McPherson, MD, had previous experience with PerfectServe in another healthcare organization. McPherson was familiar with the benefits of PerfectServe and was able to champion the project using his past experience with implementation. While the implementation of PerfectServe helped MRMC improve all forms of clinical communications, this case study focuses on the ways in which PerfectServe specifically helped the organization monitor and refine its physician consultation process. PerfectServe is a comprehensive and secure communications platform that routes voice, text and Web- and system-generated communications based on clinician workflow and personalized algorithms, allowing physicians, clinical teams and practice groups to selectively filter and control when and how they are contacted. PerfectServe’s “rules engine” filters communication events based on multiple variables unique to each clinician, which can be updated easily via a phone or mobile device. To contact a physician using PerfectServe, the individual calls a single extension or uses the web-based texting function. By indicating either the physician’s name or specialty, the caller is automatically connected to the physician via the mode of communication preferred by the physician at the time. If the physician prefers not to take the call or text at the time, a message is sent. Either way, the contact is tracked and documented. The caller does not need to know the physician’s call schedule or office hours beforehand — PerfectServe stores this information and routes calls and messages accordingly. Data are housed securely with PerfectServe rather than on the caller or recipient’s device, ensuring compliance with HIPAA regulations. Prior to PerfectServe implementation, staff at MRMC used a fairly common process for communicating with consulting physicians. During the day, the secretary in the relevant unit would telephone the consultant’s office staff, who would relay information about the consult request to the physician. The process resulted in delays in the notification of consultants and in patient care, as well as frustration for nurses, physicians and clerical staff. MRMC leaders were not only concerned about the timeliness of consultant contact, but were also looking to assist physicians in dealing with the overwhelming number of calls and emails they fielded, a portion of which had been directed to the wrong physician. Having identified an opportunity to improve clinical communications, the organization implemented PerfectServe in 2010. Implementation across the hospital went smoothly, according to Diane Coleman, performance improvement manager at MRMC. After an initial adjustment period, staff and physicians were pleased with the ease and reliability of communication. Staff readily adopted the tool for contacting physicians throughout the hospital and beyond its walls. Coleman says the finding was surprising: “During implementation and education we emphasized that PerfectServe was to be used for all clinical communications.” Instead, staff members were continuing to use paper log books and to hold consult requests on nights and weekends. “Knowing this helped us to understand the required shift in culture that needed to accompany the use of PerfectServe,” says Coleman. “In the past, MRMC staff had followed the instructions of each physician about what to do with their calls. To be successful with PerfectServe, we needed staff and physicians to be compliant. By further addressing the culture and having dialogue on where we needed to be, we were able to change this process.” As staff and physicians began using PerfectServe for all communications, the variance was eliminated, call time improved and users gained more confidence in the system. With PerfectServe in use for referral requests as well as otherclinical communications, MRMC is better able to manage the consult process, with a standardized, streamlined process that includes tracking and analytic capabilities. Now, the unit clerk accesses PerfectServe either by phone or the web link and requests the consultant by name or specialty. The consult request is transmitted directly to the physician, based on data stored in the rules engine regarding contact preferences, time of day and call schedule. The process removes the middle person — the consultant’s office staff or answering service — thus streamlining communication and reducing the chance for human error. As Coleman describes it, “Without all the ‘noise’ on how to communicate to whom, we could focus on the timely and safe delivery of patient care.” Leaders are assured that staff are consistently using PerfectServe for all communications, and the number of consult requests in the PerfectServe logs now matches the number in the order entry system. 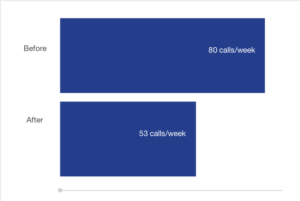 PerfectServe analytics demonstrate the substantial increase in call volume related to consults once staff had been re-trained in late 2012 (see figures below). The use of PerfectServe has removed variability in the process of contacting consultants and has decreased call-cycle time. MRMC has seen positive results in a number of areas. A value stream map showed that the process for contacting a physician dropped from 17 steps to six. Use of web contacts versus phone calls increased from 2 percent to 51 percent, saving staff time and reducing the need for repeat calls. In addition, because of the reduction in rework (e.g., making multiple calls to contact a physician), labor requirements for clerical staff dropped from 72 to 46 hours per day, which resulted in $232,000 in hard savings per year. Simultaneously, the throughput time in the emergency department (ED) also declined, and the organization is meeting its target numbers for door-to-physician and door-to-discharge time in the ED. According to Coleman, consulting physicians appreciate the fact that they can receive urgent requests for consults in the communication mode they prefer and can have routine requests sent to them in the morning rather than during the night. Also, by accessing the stored routine requests on Sundays, they can better plan their Monday morning rounds and workflow. Clinical and clerical staff appreciate the streamlined communications process. Office staff can make changes in a physician’s call schedule easily via the computer. The standardized, reliable process ensures that they contact the right physician the first time. Beth Bennett, RN, charge nurse on the cardiology unit, appreciates that she can send a consult request when it is ordered, even in the middle of the night, and can receive a confirmation that it was sent. In the past, she would need to call several times if a consultant’s office was closed, which meant another task to remember until the call was completed. Coleman points to some additional benefits. PerfectServe allows for multiple clinicians to be notified at once, reducing delays or gaps in care. For example, a surgeon who is beginning a surgical procedure while on call can have a physician’s assistant and other surgeons notified to cover for consultation requests or new admissions, which means that patient care issues can be addressed more quickly. Plus, the data regarding team calls have helped with resource planning. Managers have used PerfectServe analytics to assess and adjust staffing levels for specific care teams. MRMC implemented PerfectServe to improve the standardization and reliability of clinical communications. Having identified a gap in the consultation referral, the organization provided additional training and facilitated the use of PerfectServe for contacting consultants. Within a few months, call-cycle times for referrals had dropped. MRMC also experienced decreased staffing needs and increased throughput in the ED. MRMC plans to continue using PerfectServe analytics to improve clinical communications and optimize patient care throughout the organization.